Restlessly inventive improvising trio Medeski Martin & Wood have embarked on an ingenious new experiment dubbed The Radiolarian Series. 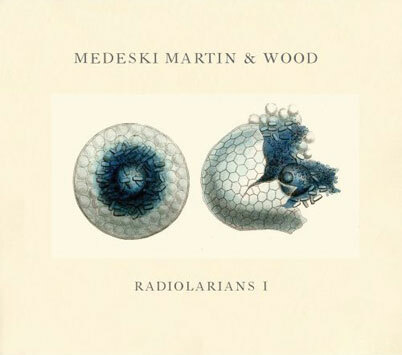 In February Medeski Martin & Wood began their Radiolarian Series, a three run, three record project. In direct contrast to they way things are usually done MMW decided to spend 2008 composing the skeleton of new music, taking it on the road to flesh out the composition, and finally putting the by now well played notes down as tracks. Three times. Radiolarians 1 is the first in this 3 record series. Radiolarians (also radiolaria) are amoeboid protozoa that produce intricate mineral skeletons, typically with a central capsule dividing the cell into inner and outer portions, called endoplasm and ectoplasm. " These "Unicellular Planktonic Marine Organisms" grow their intricately beautiful patterned skeleton around their soft core in defiance of normal biological process, similarly to Medeski Martin and Woods latest creative cycle. Some of the best examples of Radiolaria can be found in German Biologist Ernst Haeckel's book Art Forms From The Ocean: The Radiolarian Atlas Of 1862.
well, think again, cause i'm not sure aquatic protozoa (delivered with full exoskeleton) are still that big of a seller these days...Live at Planktonic!